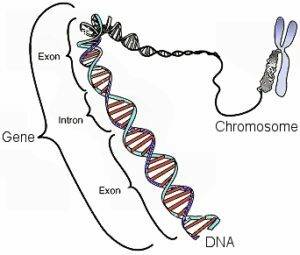 In DNA, a gene is made up of exons and introns. The exons determine the protein that is made. DNA is incredibly complex, so it’s really not surprising that the more we examine it, the more it challenges our notions of how it works. Consider, for example, genes. They make up less than 2% of human DNA, but they are important, because they tell the body what proteins to make and how to make them. At one time, evolutionary scientists actually thought that the vast majority of the rest of human DNA was useless junk. However, like most evolutionary ideas, that notion has been falsified by the data. Despite the fact that they represent less than 2% of human DNA, genes are obviously important, because most of the chemical reactions that occur in our bodies are controlled by and depend on the proteins that genes specify. Because of the amazing design behind DNA, however, a single gene can actually produce many, many different proteins. This is because, as shown in the drawing above, a gene is actually constructed of introns and exons. The exons represent functional modules in the gene, and the introns separate those modules. When a gene is read, the exons can be grouped in many different ways, producing many different proteins. Because only the exons are used in the production of proteins, geneticists often study an organism’s exome, which is the collection of all the exons in a organism’s DNA. When it comes to animals, studying how the exome affects overall health is difficult, but straightforward. Scientists can damage the gene of an animal and see what health consequences arise. This is referred to as a gene knockout, and it is an invaluable tool for learning what a gene does. For example, when the gene lovingly referred to as PRDM9 is knocked out of mice, they become sterile.1 Thus, we know that the PRDM9 gene is essential for reproduction in mice. When it comes to humans, it’s not ethical to do gene knockouts. However, you can study a population and find examples of people who have a natural mutation that has disabled a gene. By comparing that person’s health to similar people who have a working version of that gene, you can learn something about how the gene affects health. A recent study published in the journal Science did just that, and the reported results were surprising, to say the least! That’s not the only surprise from the study. Remember the PRDM9 gene? When that gene is mutated to non-functionality in mice, the mice are sterile. However, there was one woman in the study whose PRDM9 gene was mutated to the point that it is apparently nonfunctional, but she had a child! Obviously, then, while a mutated PRDM9 gene in mice causes sterility, it doesn’t necessarily do the same thing in people. How can we understand these results? It’s too soon to say with any certainty, but I have a few thoughts. First, it’s possible that what we think are gene-destroying mutations don’t actually destroy the genes. Thus, even though the mutations the authors saw are generally thought to break the genes, perhaps the genes are (at least partially) functional after all. Second, we know that there is a process called RNA editing, that changes the product of a gene before the protein determined by that gene is actually made. It’s possible that some kind of RNA editing is “fixing” the product of the broken genes so that even though the gene is broken, the protein is still produced properly. Finally, it’s quite possible that the human genome is more redundant than the genomes of animals, allowing people’s DNA to compensate for broken genes in a way that an animal’s DNA cannot. Of course, the authors are already doing another study on another group of people (South Asians living in East London) to see what else can be learned. Most likely, it will take many more studies to get to the bottom of these fascinating results. However, one thing is already quite clear: we have a lot more to learn about DNA and how it relates to health! When I hear anything these days about the impact of genes on people, I can’t help but think of the “gay gene” controversy. Do you believe that genes can code for certain behaviors, even negative behaviors, Dr. Jay? If so, what impact if any do you think this study could have on that debate? If genes thought to result in adverse health affects can be compensated for, would it be possible for genes thought to code for negative behavior to be compensated for? Thanks for this blog, and thanks for your time to answer my question! I am happy to answer your questions, cjl. I think there is strong evidence that certain genes predispose you to certain behaviors. For example, if alcoholics are studied, there are certain versions of genes that are more prevalent in alcoholics than in non-alcoholics. However, there are non-alcoholics who have the “alcoholic genes,” and there are alcoholics who do not have the “alcoholic genes.” As a result, it is thought that some genes can predispose a person towards alcoholism, but a person with those genes can fight that predisposition. If we apply the same reasoning to homosexuality, then, we could say that it is possible that there are some genes that predispose a person to homosexuality. However, unlike alcoholism, there are no studies that have identified those genes. Also, it’s possible that this reasoning can’t apply to homosexuality, because of its effect on reproduction. After all, any gene that even predisposes a person to be less likely to reproduce should become less and less prevalent with every generation. After all, even if you are only 1% less likely to reproduce with a given gene, then each generation, there will be more offspring produced by people who do not have that gene. Thus, the gene should represent a smaller and smaller percentage of the gene pool with each subsequent generation. That doesn’t seem to be happening with homosexuality, so that argues against a genetic component. Now, there has been a small study that might have found epigenetic markers (not genes, but chemical “additions” to the genes which affect their expression) that predispose a person towards homosexuality. However, the study is small and its conclusions are weak. Of course, epigenetic markers can be influenced by environment, so it’s not even clear that this effect (if real) is wholly biological. So it appears then that we already have good reason to believe that genes which create predispositions to certain behaviors can be overcome on the behavioral level. To that, this study adds the possibility that genes which code for negative traits or are broken in some way may possibly be overcome on the genetic or chemical level. Would that be fair to say? Additionally, you make a very profound point about the gay gene. If it does exists, simple mathematics should have weeded it out generations ago. You are correct. Predispositions given by genes can be overcome at the behavioral level, and this study indicates it might be possible to overcome broken genes at a chemical level. I do think that anyone who posits the existence of a genetic predisposition to homosexuality must, at minimum, explain why that doesn’t seem to lead to a decrease in the percentage of homosexual people over time. You are probably right, Joe. I don’t agree genes have any place in behavior like gay or booze. this is a fable. this is unbiblical is taking away the blame. Alcolhols are just people stuck in a memory of the pleasure of booze. No genes going on. if so imagine all those but whose cultures never made good booze. being gay is a breakdown in the body. however its not a gene put in. There are no gay animals. they are all willing bisexuals.. It really doesn’t matter whether or not you agree, Robert. The fact is that genes definitely do affect behavior. You can ignore that fact if you want, but ignoring facts is not a Biblical way to behave! There is no “taking away the blame” here. This is just an analysis of the physiology involved. Certain genes increase the “high” experienced from the consumption of too much alcohol, reduce the metabolism of alcohol, reduce the hangover effect afterwards, etc., etc. These physiological effects make a person more prone to alcoholism. However, as the research clearly shows, there are plenty of people with the alcoholism genes that aren’t alcoholics, and there are plenty of alcoholics without the alcoholism genes. Thus, alcoholism is still a choice, but it is a choice that is harder to avoid by some, because their genes predispose them to enjoy consuming excess alcohol more. Genes don’t affect the behavior because we are immaterial souls. its impossible. Does the bible EVER say its possible/ No! There is malfunction like Jesus explained for eunuchs and so we can translate to gays. I agree minor details like metabolism etc etc can be affected by genes. The HIGH is not of genes however. its common for all. I don’t agree that is genes. Saying our GENES did it is saying what evolutionists say. For they say we have no soul and so are a brain only which is affected by the genes. Alcoholism is always the persons fault. jUst like obesity. Yes practical medical details can kick in but alcohol only affects the memory. not our soul. there is no booze or gay genes. there can be malfunction only in minor details. This must be a biblical boundary. Once again, Robert, denying the facts is not Biblical behavior. If genes don’t affect behavior, please explain to me why certain genes are significantly more prevalent among alcoholics than non-alcoholics, and why those just happen to be the genes that are related to parts of the body that alcohol affects (metabolic enzymes, liver enzymes, and neurological proteins). The Bible doesn’t mention genes, so it’s not surprising that the Bible doesn’t mention the fact that genes affect behavior. The Bible doesn’t mention computers. Does that mean computers don’t exist? Yes, we are immaterial souls, but those souls are housed in material bodies, and the body and soul clearly interact. Thus, genes can and do affect behavior. Denying that fact will not make it go away! Yes, alcoholism is always the person’s fault. However, that doesn’t tell us anything about whether or not genes can predispose a person to alcoholism. As Jake correctly pointed out, you are using worldly thinking here. From a Biblical point of view, we know that we are all born in sin. Thus, it’s not surprising that our genes can urge us to sin. Yes metabolic, liver (not neuro) are real physical things , gene influenced, that can be more prone to effects of alcohol. Yet that doesn’t affect our thinking. further its not the origin of alcoholism in anyones conclusions. They mean genes deeply affecting behavior. Affecting free will. likewise being bigger or smaller would matter. I understand alcoholism has a heavy male ratio( i think i read 7:3). Yet not because males have the booze gene more. yes we are immaterial souls stuck in a body. Yet its impossible for the soul to be affected itself and so only the mind is affected. i see the mind as exclusively the memory operation. Our memory is of the material world. our soul is meshed to our memory. I do see booze as only affecting the triggering mechanism for the memory. However I just want to pull away from gay/booze genes stopping , or interfering with the free will. There is a breakdown but not a infusion. People are gay because of malfunction but not because of actual different genes for thought. Anyways my point is to deny our will and soul are influenced by the material world. Yes our memory system and physical system but thats all. We conclude that NLGN4X was a significant male-specific risk gene for alcohol dependence in European-Americans. NLGN4X might harbor a causal variant(s) for alcohol dependence. Guess what NLGN4X is. It is a gene that specifies a NEURAL protein. Thus, alcoholism is linked specifically to neural genes. Of course, this isn’t the only study that specifically implicates neural genes in alcoholism (see here, here, here, and here). Whether you want to admit it or not, our genes do affect our behavior, as all the studies I have shown you demonstrate. The world wants to say that since we’re “born that way”, we shouldn’t take any of the blame for who we are and how we behave. But this is precisely the opposite of the truth – that humanity fell and dragged the universe down with it. The “way” we are born is in sin, and we don’t waive responsibility for that just because that’s how we came out. So it shouldn’t be surprising if we’re born with physical dispositions to sin in addition to our spiritual fallenness, as that too is part of the fall. The fact that genes affect behavior is clear, and this is completely consistent with what the Bible teaches. its not worldly ways. its biblical boundaries as i see it. Probably a minority of YEC people see these boundaries but I think they can be seen. your example had the researchers saying MIGHT BE A CASUAL FACTOR. Might be is not the same as proven. YEC knows that. They CONCLUDED it was a specific gene factor. I say they are wrong. Further they said for europeans. All this tells me its another dumb evolutionist presumption study EXPECTING to find genes for alcoholism and to explain why men more then women. Men simply drink more and are more aggressive in abusing it. Men party harder then women. Nothing to do with genes i say. its a fable. They are guessing. All they can do is what? Find some gene in alcoholics more then otrhers? If alcohol affects people it easily might provoke some gene to be more expressed. anyways with the same confidence YEC takes on evolutionism and its studies this YEC takes on the fable of a gene for alcholism or gay or any thing affecxting the will. Yes breakdown as i explained earlier. The only enticement i can make to careful YEC thinkers like you is a claim of the Soul not being affected by the material world. You agree but still see something next door. The whole gene industry to explain human behaivor is a evolution one. Its not yEC presumptions. I know many like you can still see genes affecting alcoholo tolerance but i think not. They have to prove to me there is a gene and how could they do that. All they do is score the gene presence, the one in this study, in acholics relative to others. That means nothing to me in proving things. other options. Finally they admit its casual or rather coincidental. Thats all it is. its primitive investigation like all evolutionary stuff. Your thinking is most certainly worldly, Robert, and it has little to do with Scripture. As Jake has pointed out, Scripture indicates that we are born in sin, so it is not surprising that our genes can urge us to sin. Also, denying obvious facts is not a Biblical way to approach any topic! You claim that the researchers are wrong, but you give absolutely no evidence to support your claim. Please give evidence to support your claim. What specific mistake did the researchers make that caused them to come to the wrong conclusion? Also, please indicate the specific mistakes made by all the other researchers on all the other studies I have shown you that clearly demonstrate that alcoholism has a genetic component. Until you do that, you are doing nothing more than ignoring the facts. You claim, “If alcohol affects people it easily might provoke some gene to be more expressed.” That’s interesting. You seem to be willing to admit that behavior affects genes, but you aren’t willing to admit that genes affect behavior. Do you not see the obvious problem with that kind of thinking? Twin studies have found that monozygotic twins are more likely to be concordant for alcoholism than dizygotic twins. In case you are unfamiliar with the terms, monozygotic twins have identical DNA, while dizygotic twins do not. Both kinds of twins in the studies done, however, shared the same womb at the same time and were raised by the same parents. Nevertheless, those twins with identical DNA were much more likely to share alcoholism than those who didn’t have identical DNA. If genes don’t affect behavior, why is that? Adoption studies have found that adopted-away children of alcoholic parents are more likely to develop alcoholism than adopted-away children of nonalcoholic parents. Since all the kids were being raised by parents other than their biological ones, why is it that the biological children of alcoholics were more likely to be alcoholics? The answer is quite clear: Because they inherited the tendency towards alcoholism from their biological parents, through their genes. Please do not claim to be thinking Biblically in this instance, Robert, because denying the facts has nothing to do with following Scripture! Thanks for pointing that out, Jake. I figured out how to stop the nesting after four. After that, they stop going any farther to the right. Hopefully, that helps in terms of readability. I think you’re giving too much to the worldly way of thinking here: The world wants to say that since we’re “born that way”, we shouldn’t take any of the blame for who we are and how we behave. But this is precisely the opposite of the truth – that humanity fell and dragged the universe down with it. The “way” we are born is in sin, and we don’t waive responsibility for that just because that’s how we came out. So it shouldn’t be surprising if we’re born with physical dispositions to sin in addition to our spiritual fallenness, as that too is part of the fall. Hello doctor! You have a nice website here! I have a question for you: Do you know something about the RATE project made by some importants creationist site such as ICR and CMI? if so, tell me your opinion. God bless you! I am familiar with the RATE project, Victor. I think it broke some really interesting new ground. Specifically, I think the helium trapped in zircon analysis was very interesting. I also liked the study on what would need to happen to change radioactive decay rates. While it wasn’t an exhaustive analysis by any means, it gave at least two plausible scenarios. I am not thinking worldly, whatever that is, and am dealing with facts. just different interpretations. i explained why the research was wrong in my previous post for the one you listed. in like manner all of these. your twin thing has other options. first it would mean MALE twins i guess. Not female. Kids being adapted easily stresses those kids all their life. its not needed to see genes as the point. itys the adoiption issue. Yes i think we can trigger our genes that affect our body. Not however our genes affect our will. Or greatly imprisoning our inclinations. All that a study can find is a simplistic comparison. Thats it. Not very complicated. Then they guess there is a gene and guess which one. In the study you quoted it was clearly a guess on all accounts. Again details about the body being weaker to alcohol is okay. yet not booze affecting our thinking/lack of control by some gene. I think its against the concept of the soul and free will and the whole sense of scripture of us being responsible. No excuses for MY GENES MADE ME DO IT OR ADDED TO IT. I do think its a issue of the memory. Like a phobia and that is material. Anyways creationists can disagree and do and did. I desire healing but am confident genes is a dead end. You are not dealing with the facts, Robert. You are ignoring them. This has nothing to do with interpretation. You simply do not like the facts, so you are ignoring them. That is anything but Biblical. You did not explain why the research was wrong in your previous posts. You simply said, “I say they are wrong.” That’s not an explanation. Tell me, specifically, what is wrong with each of the studies I have shown you so far, each of which demonstrate quite clearly that alcoholism does have a genetic component. The twin studies do NOT have other options. The fact is that identical twins (both MALE AND FEMALE) are more likely to share alcoholism than non-identical twins. They all share the same womb, the same parents, the same environment, and the same upbringing. If one identical twin is alcoholic, the other is very likely to be alcoholic. However, if one fraternal twin is alcoholic, the other fraternal twin is no more likely to be alcoholic. Why? If it is not genes, what SPECIFICALLY is it? You claim that for adopted kids, its the adoption issue, but it clearly is not, because ALL the kids in the study were adopted. Thus, they ALL share the same kinds of stress. However, the adopted kids who have at least one parent who is an alcoholic are far more likely to be alcoholic than the adopted kids who do not have an alcoholic parent. Once again, the environment is the same. The difference is the genes. Thus, genes clearly play a role in alcoholism, no matter how many times you try to deny it. You claim this is a “simplistic comparison,” but it is not. In both the twin studies and the adoption studies, the comparison is detailed, and the results clearly show that alcoholism has a genetic component. Also, there is no guesswork involved. The results are conclusive. The fact that you don’t like the results doesn’t make them any less conclusive. You seem to not know what worldly thinking is, but you are constantly using it. You used it again here when you said, “No excuses for MY GENES MADE ME DO IT OR ADDED TO IT.” That’s a worldly way of thinking. From a Biblical point of view, whether or not your genes add to your tendency towards alcoholism, you are still responsible. Thus, accepting the fact that genes contribute towards alcoholism doesn’t take one iota of responsibility away from the alcoholic, as long as you are looking at things Biblically. If you are looking at things in a worldly way, then the fact that genes contribute to alcoholism absolves the alcoholic of blame. It’s a shame that you can’t shake off that worldly way of thinking. You claim that you desire healing, but since you are unwilling to even accept the fact that genes contribute towards alcoholism, I find that very hard to believe. Healing requires understanding, and if you simply deny the clear fact that genes contribute to alcoholism, you are not interested in understanding. Since you are not interested in understanding, I don’t see how you can be interested in healing. To finish what has been another interesting scientific subject with creationist worldviews I will address the studies. The studies do nothing but compare people. They do not prove any genetic link but only link peoples alcoholism/or not. THEN they conclude its genes. Very much like most evolutionary ‘Evidence” they bring up in origin issues. like fossils. Your written example had the researchers saying it was guessing. THey said MIGHT have a CASUAL varient etc etc. Might is the important word and so is casual. They are just guessing about which gene and if any gene. They only know comparing people. I say they do a incompetent job. Other options can explain why separated twins etc might get alcoholic. Alcolihism is just a variety of dysfunction like any others. Kids adapted , easily, are always unhappy about it. Those adapting easily can have the same problems. as in our homescholing discussion demographics matter as I see it. I need heaps of better studies that are more then comparing twins or anyone to demonstrate the very unlikely claim of the body having genes for the human invention of alcohol. We did agree there could be liver issues or just size issues for those drinking too much. Yet thats different then the real mENTAL dependency that is the problem. Our bodies don’t likely have genes to make lliquids, we invented, more problematic. Including the males worse then the females. Males are simply more boozers and on a curve therefore have more booze problems. The studies are comparative on people and not the body. Not allowing other options, which are legion, in demagraphics. Booze is not from nature but invented. Genes don’t control the will. Its a memory triggering issue llike any compulsive behaviour. Healing , i think, can come from not looking /justifying it by genes. Unfortunately, Robert, it hasn’t been a scientific discussion, because you aren’t willing to address the science. Instead, you ignore the facts because they disagree with what you want to believe. That is neither a Biblical nor a creationist view. It is a denial of reality. The studies do, indeed, show a direct genetic link to alcoholism, because they compare people with identical genes and then contrast them to those who do not have identical genes. When they do that, they find that those with identical genes are much more likely to share alcoholism. That means alcoholism has a genetic component. They also show that alcoholism is hereditary, even when the children are raised by different parents. Finally, the myriad of studies I have given you then find the specific genes that have the link. This is nothing like fossils or the “evidence” that evolutionists give. These are repeatable studies that consistently give the same results. My written example did not have the researchers saying it was guessing. It had them showing that those who had a specific version of a gene were more likely to be alcoholic than those who didn’t. Once again, that’s a direct link. Perhaps you don’t understand the word “causal.” When something is causal, it means it causes something. Therefore, when they say the gene harbors causal variants, that means it has variants that cause alcoholism. You claim that the researchers did an incompetent job, but you give no evidence. That’s the difference between this discussion and a scientific discussion. You refuse to explain why the researchers are wrong. You simply say they are wrong and incompetent, but you give absolutely no evidence or reason. That’s not being scientific. It is being unreasonable. In addition, I have asked you twice to give me an alternate explanation, but you can’t. Once again, in a scientific discussion, you would give an alternate explanation if you didn’t like the one presented. However, you didn’t give an alternate explanation. You just claimed the accepted explanation is wrong. That’s not science. That’s not even being reasonable. Unfortunately, this seems to be a pattern for you. You simply ignore any facts that you don’t like. This is frustrating and, quite frankly, it gives YECs a bad name. As a result, I can no longer accept your comments on this blog. As a cap to all this, can we address the free will question Robert brought up? Because my impression is that, though we might disagree on the details, Christians tend to think that people don’t have free will to choose good before God intervenes in our lives somehow. Or, at least, our wills are corrupted by sin. It sounded to me like Robert was going beyond even the flawed argument that there aren’t built-in physical tendencies to sin and wanted to say that our wills are separated from the world and not bound by sin. I did think what you said was wise, and for most people, I don’t think it needed clarification. Robert seemed to be arguing that while our free will can influence our genes, there is no way our genes can influence our free will. That, of course, is nonsense, as the studies I showed him clearly demonstrate. It seems to me that we have free will with or without God. I just think the Holy Spirit gives us strength to use our free will for the good. As a result, with the Holy Spirit inside us, we can choose to do good more often. Oops – we may be talking about different things: I think most Christians do believe that people can perform outwardly good acts – like civil goods – without being saved. And that includes not succumbing to temptation, whether it be alcoholism or eating too many peanut butter M&Ms (which is what I’m doing now). There are some nuances to this, as one could argue about how much God in His common grace to all humanity holds us back from being as bad as we could be, but I don’t know of anybody who disagrees with Jesus when He says even the wicked love each other (Luke 6:32). But what’s more important is whether we can come to Christ of our own accord. That’s what I meant when I said “choose good”, which I’ll admit isn’t the most obvious way to read that. So what I should’ve said is that Christians tend not to believe we can have faith in Christ unless God intervenes first. Thanks for clarifying your question, Jake. Christ Himself said, ” No one can come to Me unless the Father who sent Me draws him; and I will raise him up on the last day.” (John 6:44) Thus, I think it’s clear that without God’s intervention (the Father drawing us), no one can choose Christ. Now…the extent to which He draws us is the main point of contention between Calvinists and Arminianists.